Thomas Delaney is a valuable source of points in the Official Fantasy Bundesliga. Set up your Official Fantasy Bundesliga team for Matchday 25 NOW! As a result, I’ve kept an even closer eye than usual on my five Fantasy recommendations this week. I’m confident that the following quintet all represent good value for money. No other player has profited more from Schalke’s return to a flat back four than young Kehrer. The 20-year-old has started the Royal Blues’ last two league games, winning 18 fantasy points in the process. He has also averaged 14 successful challenges per game in that time, making him one of the most in-form defenders in the game. I highly recommend signing him now before his price skyrockets in the summer. 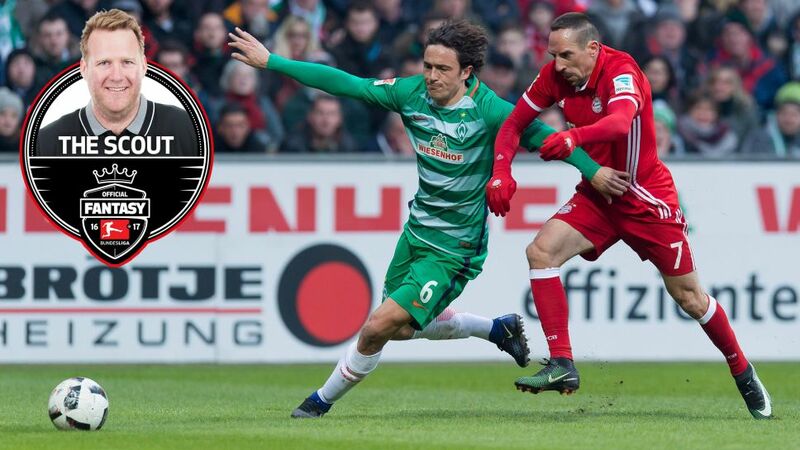 Having scored his first Bundesliga goal on Matchday 20, the Dane was hit by a bus – aka Jhon Cordoba – in Bremen’s 2-0 victory at Mainz the following week, forcing him to sit out the next two games with concussion and a fractured cheekbone. The technically-gifted ball-winning midfielder is not only one of Werder’s greatest assets: His goal-threat from distance coupled with his tackle success rate - he has averaged over 14 successful challenges per game – makes Delaney an incredibly valuable source of points for your Fantasy team. Mario Gomez is the obvious choice for your attack this week. The 31-year-old has scored in both his appearances under Jonker, but my colleague James has already recommended him in his piece. That’s why I’ve gone for Choupo-Moting, who I think might even be a better long-term choice than Gomez: He wins far more challenges and was Schalke’s standout performer in the 3-0 victory over Augsburg – apart from two-goal hero Guido Burgstaller. The Cameroonian has missed a large chunk of the campaign through injury, but that might mean he is less likely to suffer from fatigue in the coming weeks. He certainly had a spring in his step against Augsburg and in that sort of form, Choupo-Moting is a nightmare for opposing defenders – and a dream for every Fantasy coach. We’re heading into the final straight of the inaugural Official Fantasy Bundesliga season. Hopefully my A-Team will help give your team a boost in the standings on Matchday 25!